Not just for tagging clothes, Invented by Avery Dennison, the tag attaching system revolutionized the way apparel and retail industries tag and price mark garments. Today, the Avery Dennison Swiftach tag attaching system is the newest, safe and easy alternative to string, tape, thread, pins, metal staples, hooks and twist ties. What can we fasten for you today? There are three primary applications in the apparel manufacturing market that utilize Avery DennisonTM Swiftach® fasteners: price and/or brand ticketing, product pairing and product display. The critical criterion for selecting which fastener family to use for your application is the type of material. Delicate Fabrics (silk, satin, nylon, lingerie, elastic, micro fibers lycra, rayon, polyester) commonly utilize the fine Fabric family attaching system. Conventional Fabrics (cotton, cotton twill, denim, corduroy,fur, wool) commonly utilize the Standard family attaching systems. Industrial Fabrics (multiple layer denim, leather, canvas) commonly utilize the Super Heavy Duty family attaching system. There are three primary packaging applications: pairing, securing and product display. For packaging applications the t-end, loop, hook, nylon paddle, and secur-a-tach style fasteners are most commonly used. The t-end, made from heavy-duty nylon, is the most widely used fastener in packaging applications. It provides a strong, secure attachment with a finished "look" with its two-sided t-end. Many applications that use metal staples in packaging have switched to the use of t-end fasteners because of the reduced risk of garment damage, especially in fine woven materials, which can easily snag or tear fiber's when metal staples are used. The loop style fasteners have several packaging applications. Because loop fasteners are fired twice, they can be used to loosely pair items together and to "hang" soft goods and increase product visibility on display. The most frequent packaging application involving loop fasteners is to secure products in place, such as in chipboard "window" boxes. Because the loop is attached by a hand tool, time spent manually fastening products in packaging is eliminated. Hook style fasteners are available in 1 1/2" (36mm) and 2" (50mm) lengths and provide not only a means of attaching a tag, but also a hanger for display items. Hosiery and head wear items are ideal for this type of fastener. Hook fasteners are available in general purpose and heavy duty strengths. Avery Dennison secur-a-tach fasteners are the solution for hard goods packaging. Many accessory components are attached with these fasteners, available in 3" 5" and 9" (75mm, 125mm, 225mm) lengths. 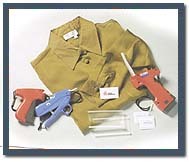 Standard gauge products are used when the fasteners are shot through seams, labels or into rugged fabric such as denim. Standard tools are also available in electric models or for use in automated equipment to speed up production and reduce operator fatigue. Tag Fast is designed for rugged use, even in harsh outdoor environments. Special materials resist corrosion and a unique drain hole feature allows for repeated cleanings. Tag Fast Needles are made from Stainless Steel to be strong and resist corrosion. 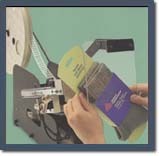 #1000's® pistolgrip design and built-in tag rest let the operator hold a ticket in place while moving the needle to the garment for easy one-handed tagging of either flat or hanging goods. The System 1000® hand tool features a special mechanism that prevents gun jams. For industrial applications, air powered Sstem 1000® units are available. Two needles are available for use with system 1000® hand tools: the standard needle, #08281, for use with most fabrics and general purposes applications; and the all-steel heavy duty needle, #10074, for use on heavier applications. Two styles of "Long" needles are available for use with air needles are available for use with air powered System 1000® units. The Fine Fabric system is preferred if the tag attaching job includes delicate lingerie, light knit fabrics and fine non-woven. Fine Fabric systems uses Swiftachment fasteners that are smaller in profile. 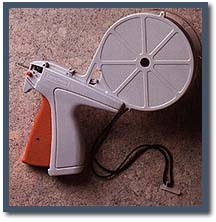 Hand-held electric units are activated by pressing a button. Since the operator does not have to squeeze the tool all day, they increase efficiency by lowering fatigue and can help prevent the onset of Carpal Tunnel Syndrome. 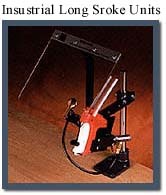 Hand-held air units are desirable when considerable force is required to insert the needle through the product. They are used to tag carpets and cardboard tubes and to link products together. Bench-mounted air units free the operators hands to work with the product and are available in a wide variety of configurations. They should be used when it is faster to bring the product to the tool rather than using a hand unit. The Mark III Electric Tools offer extraordinary results with an unprecedented combination of comfort, quickness, and capability for operators to tag continuously with reduced risk. Feature for feature, it has become the new phenomenon in high-volume tagging. Weighing just eight ounces, the Mark III Electric Tools are easy to hold and handle for long periods of time. Its ergonomic design and light-touch trigger help workers tag continuously with less fatigue. The Mark III Electric Tools are not lightweight when it comes to power. They feature high-torque motor that can fire fasteners through many layers of heavy material - even denim! And the battery pack that powers the motor is removable, rechargeable and simple to change; it can tag about 1,200 garments without a charge and enable workers to tag continuously - shift after shift - with no idle time. The Mark III Electric tool is available in both fine and standard models. Each unit can use the new 100 per clip Swiftachment Plus . The 10 Station Rapid Charger charges up to 10 batteries in 90 minutes. Avery Dennison Power Units can be custom built to better fit your individual application..
Hand Held Actuation - This method provides the operator with mobility while still offering the high productivity of a power unit. There are two types of hand held actuators. Standard Pistol Grip Actuator (SPU2A) - This version uses a trigger actuator and can be used with Standard, Fine Fabric, and buttoneer modules. System 1000 Pistol Grip Actuator (SPU3A) - This version uses a trigger actuator and can only be used with the System 1000 module. over a stationary needle. 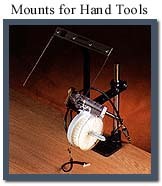 Some units use regular hand tools while others activate specifically designed industrial equipment. These units are ideal for small compact items, such as hosiery and tee shirts, when it is easy to bring them to a central tagging tube. 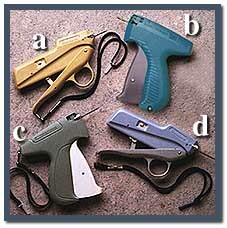 #08172 - For Pistol-Grip style tools. #10452 - For Scissor-Grip style tools. Easy to use, tamper-resistant truck seal. 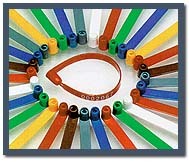 Seal is 7 1/2" long and available in eight basic colors: red, white, gray, green, yellow, blue, orange and brown. Can be hot-stamped with company name or logo and/or consecutively numbered. Taped twenty to a strip for easy handling. No burrs or pieces to break off and c reate safety hasard. Restraining stop collar is oval to prevent twisting of shaft and disengagement of locking teeth. Oval collar completely covers locking barrel to prevent tampering from above. 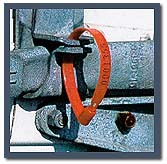 Patented locking barrel is plugged from bottom to prevent tampering from below. shaft locks into barrel plug. Seal strength can be varied (patented). Color combinations can be ordered for quantity discount. 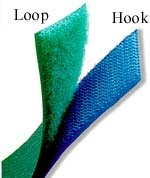 Woven from 100% nylon, our hook and loop is used in a variety of products. It comes in widths from 5/8" to 4"; and in 16 standard colors, with special colors and other special features available upon request. Monofilament hook and soft, multifilament loop tapes can be attached by virtually any method compatible with the receiving surface. So, it's versatile enough for almost any standard application.